London Guild is excited to facilitate a weekend of talks and demonstrations along with spinning and weaving workshops by visiting Mapuche weavers and teachers from Chile on the weekend of 29/30 April 2017. There will be two days of talks, demonstrations & workshops exploring Mapuche culture and woolcraft traditions from southern Chile. 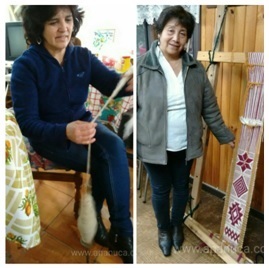 The event will be hosted by FundaciónCholchol, a Chilean development NGO, and by Isabel & Jessica, two renowned weavers and teachers who will be visiting the UK on a Chilean government-funded cultural programme. The visit is being organised in association with Liz Beasley of añañuca. Introduction by Liz Beasley of añañuca about her work in Chile. Susana, the director of FundacionCholchol, will talk about the development work of the Fundación with spinners & weavers in southern Chile. Jessica and Isabel will then both speak about their lives, their culture and their weaving. Opportunity to view (and purchase) a selection of Mapuche woven textiles and yarns. Venue: LGWSD, St Stephen’s House, 48 Emperor’s Gate, Kensington, London SW7 4HJ.